Our buffalo is from Patsy Lynch’s farm near Macroom and he delivers it directly to our stall every couple of weeks. 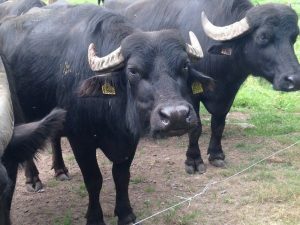 We’ve become used to Irish buffalo mozzarella cheese being widely available in Ireland, but because half of the buffalo are born male, a use has to be found for the meat. This helps to offset the costs associated with dairying and reduces food waste by using the male animals for meat. Buffalo is a sustainable, all natural, locally produced product. We have been selling Patsy’s buffalo meat since 2010 and our most popular product on the stall is our buffalo burger, which is also available at The Fishwife on Grand Parade and Mc Curtain Street. House Cafe at the Opera House often feature our buffalo on their menu, making delicious dishes such as buffalo tagine. 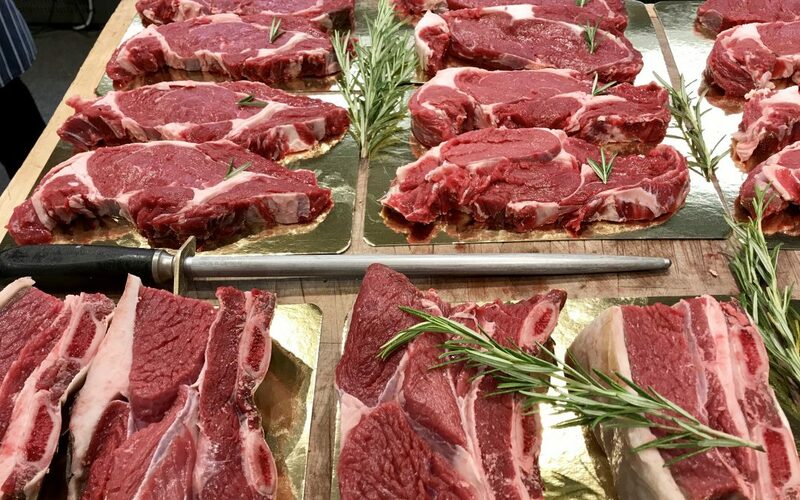 We use the whole beast from nose to tail, which means we have some limited amount of unusual cuts available such as short ribs and buffalo osso buco. The shoulder is good for rich stews and curries, for faster cooking the sirloin and rib eye are a good alternative to a beef steak. At Christmas we make spiced buffalo which is a twist on traditional Cork spiced beef. It takes more than four weeks to make spiced buffalo, which involves curing the meat in a brine followed by a few weeks marinading in a spice barrel. We only Spiced Buffalo during the month of December and it sells out very quickly due to the limited supply available.